A vast natural and man-made infrastructure delivers and treats our water, removing the impurities, regulating a healthy flow for aquatic ecosystems and the kitchen tap. It�s an over-burdened and stressed infrastructure in many places, struggling to cope with the dizzying array of pharmaceuticals we deposit, the competing uses of industry, the increasing droughts and population growth that stretch resources to the limit. Artists are working around the world in partnership with utilities and communities to increase awareness and stewardship of this precious resource, reconnecting us in often post-industrial contexts to surviving riverine environments and their inhabitants. In an ingenious twist on the ye-olde cure all remedies, Eyebeam have generated a product that makes you think twice about the efficacy of sewage treatment plants and the medication that we (over)consume all the time. Alviso’s All-Salt is produced from a water body near the San Jose treatment plant in California and the local salt flats. The myriad medical products contained in the product are offered up for free as a shockingly ready combination of anti-depressants, anti-biotics, pain relief, and so on. A darkly humourous reminder of our role in the growing impurity of the environment. display of collective interest in the environment. 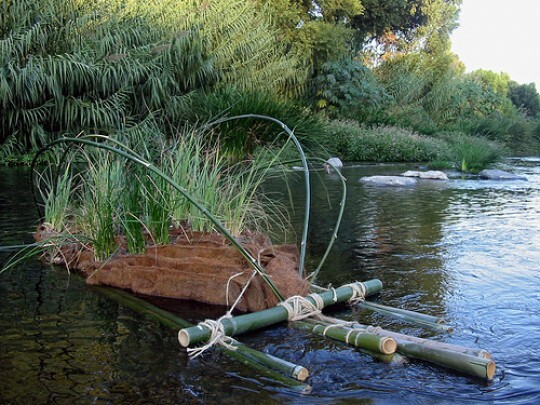 Greenmeme’s River Livers are constructed wetland sculptures that aim to raise awareness about water quality and habitat loss. 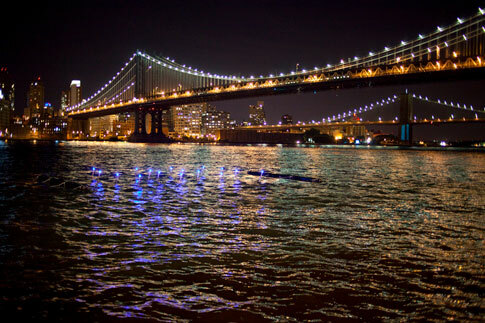 The sculptures actively break down pollutants in the water, and at the same time communicate environmental data, such as PH, to onlookers through colour-coded LED lights. Australian artist, Janet Laurence, produced the site-specific work, In the Shadow, for the Sydney Olympics within a degraded creek near the Homebush Olympic site. 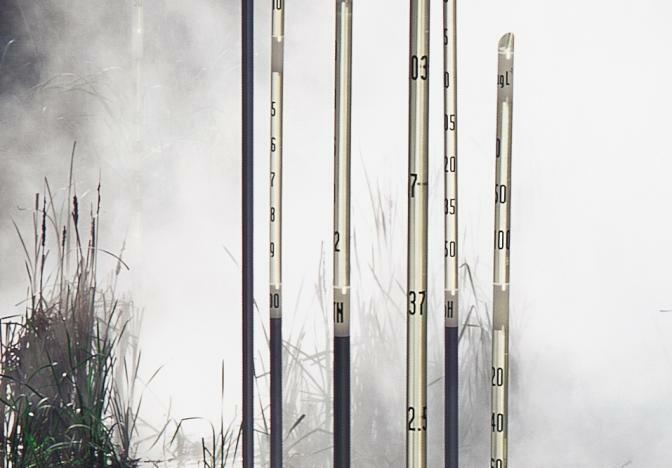 The work featured tall glass measuring rods representing the various chemical indicators of water remediation, and included the replanting of rushes and trees along the banks. Atmospheric fog circulated throughout the site, cooling and transforming the creek environment. Many years after the Olympics, efforts to deforest the creek banks were thwarted with the defence of �artwork’ – a lovely example of activist, environmental art winning over. The 2010 State of Design Festival in Melbourne focussed on the role of Design to effect change. Many environmental themes were explored, including A Liveable Cities Exhibition, sponsored by Melbourne Water, which brought together leading Melbourne designers to present fascinating installations relating to current water use and suggestions for sustainable change. Pictured is one work, which encouraged people to take home a tube, each containing a prediction of the future, to consider. An interesting example of how a company can harness the arts to visualise and communicate environmental relationships to help meet its goals. Flow by Owl Project and Ed Carter, is a remarkable new public art work in Newcastle that explores the relationship between art, environment, design and industry. 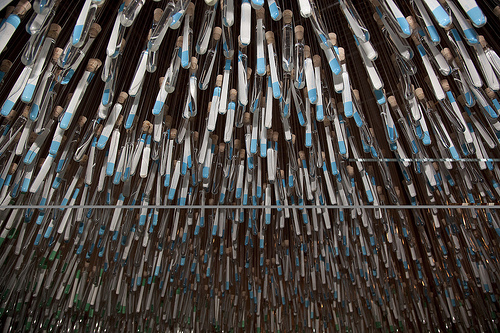 Commissioned for the London 2012 Olympic games as part of its cultural program, Flow is at once tidemill, river monitor and electo-acoustic performance. 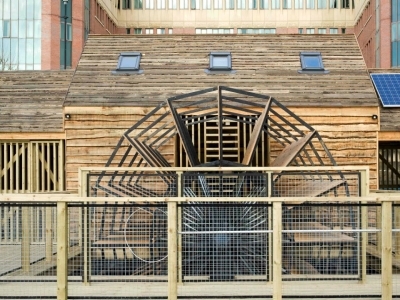 Inside the mill are housed three pieces of musical machinery: the Salinity Sequencer, the Bubble Synth and a Laser Turbidatron, all of which create unique real-time soundscapes in response to hourly river water samples and audience interaction. 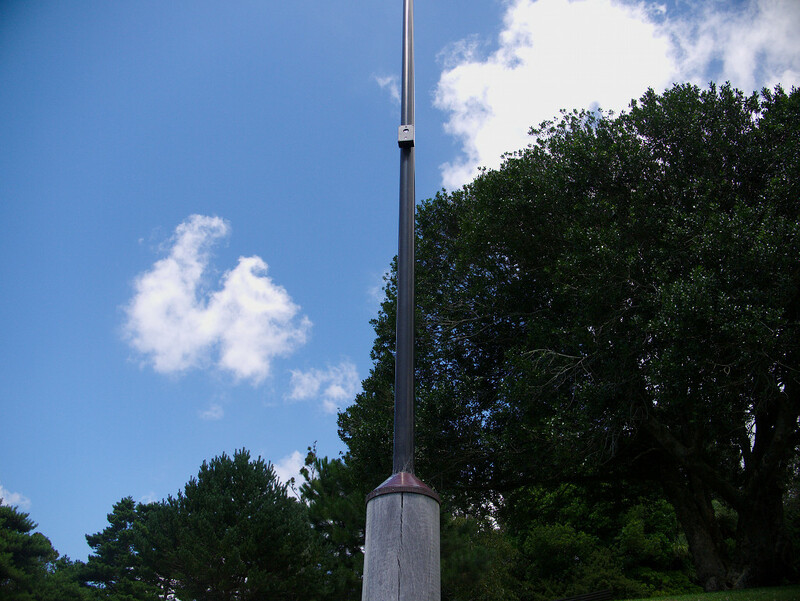 Greenmeme’s Hyperion-Son of Uranus is a sculptural visualisation of the sewerage infrastructure of LA county, represented as a time-stamp in 2009. 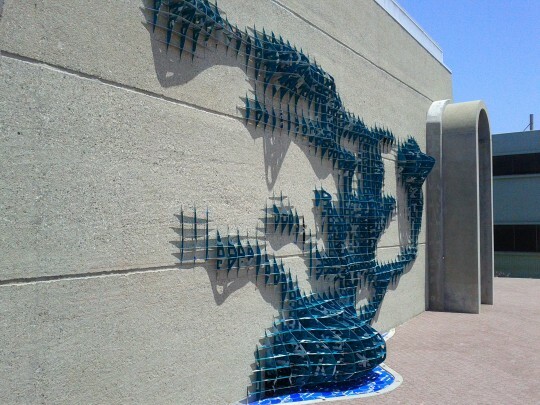 Commissioned for the new Environmental Learning Center for the Hyperion Wastewater Treatment plant, the grid-like structure bulges where pipes are largest creating a unique topography from volumetric data. Fashioned from recycled street signs collected from CalTrans over 3 years, Hyperion flashes green and silver as light hits the surface, a reminder of the multiple layers of infrastructure both visible and hidden. 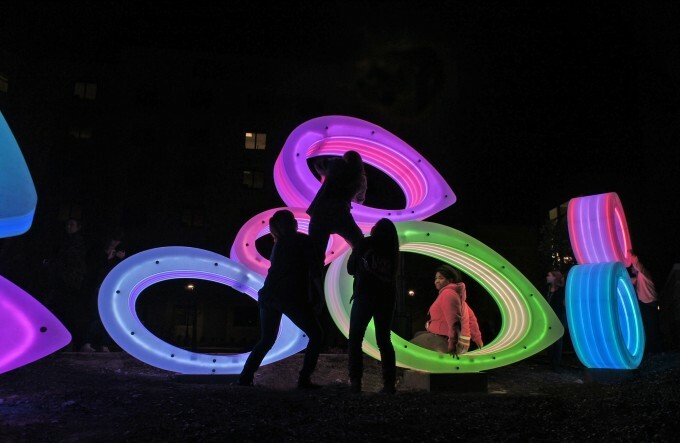 A new interactive sculpture at the Texas State University Campus aims to draw comparisons between it’s students and it’s local river life. Representative of a school of fish, visitors can interact with Fish Bellies by climbing on it and influencing its colour changes. It’s creators, JB Public Art, hope that by drawing comparisons between the social behaviour of fish and of students, the latter can become curious and engaged in the ecology and biology specific to their campus. Could it take a a synthetic representation of nature to jolt us back into re-appreciating its beauty and our reliance upon it? That’s one the questions Pierre Proske is seeking to explore with his Brickets. So named for their chirping sounds and brickish size, the Brickets reinterpret data from local environmental sources such as the nearest home’s water usage, into animal like calls, which rise and ebb in response to one another, much like a synthesised colony of frogs, cicadas or crickets.